Ansi style safety labels. Electrical hazard. Warning. 120/208 V AC. Lockout/ tagout before servicing. Self adhesive vinyl with clear protective laminate. Supplied in packs of 100 labels. Available in 2 sizes. Waterproof, chemical (oil and solvent) and abrasion resistant. ANSI safety labels for electrical hazards. 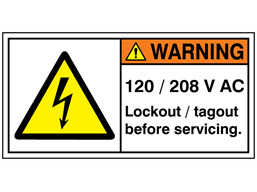 Warning, 120/208 V AC, lockout tagout before servicing. Supplied in packs of 100 labels. Abrasion, rub and chemical resistant. Waterproof. ANSI0151 Size 25mm x 50mm (nominal 1 inch x 2 inch). Material self adhesive vinyl, with clear protective laminate. ANSI0152 Size 50mm x 100mm (nominal 2 inch x 4 inch). Material self adhesive vinyl, with clear protective laminate.